If you’re looking for a way to light up or illuminate your stairs, you’ll find that there are a couple readily available options. If you’re just looking to temporarily light a step to allow for emergency egress or ingress in the case of a power outage, a photoluminescent stair nosing or standard nosing with a photoluminescent strip could be your best option. The length of time that the stair nosing or strips remain visible after the light source is removed varies depending on the manufacturer and quality of light that the profile is exposed to on a continuous basis. I came across an interesting article by DHi that gives more extensive information about photoluminescent products and details some of their offerings. Gradus has a photoluminescent insert that can be used with some stair nosing profiles, but doesn’t offer a full photoluminescent stair nosing or tread. 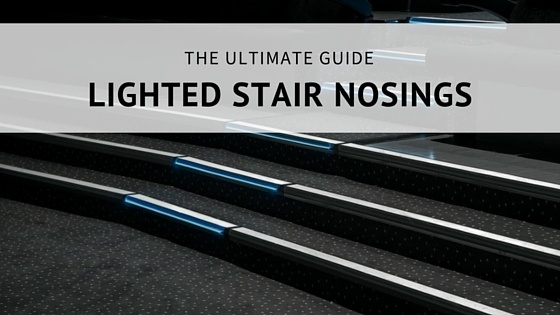 Another option is long-term lighted stair nosings, like the Gradus LED Lighting Systems. These are the lighted profiles you see in places like movie theaters, casinos, and cruise ships. These stair nosing profiles are designed with tracks to hold a light source that will run off of electricity. Optimum Technologies, Inc. offers stair nosings for lighted stairs in aluminum and uPVC (rigid PVC). These options give you the choice of making the light shine up, down, angled, or straight ahead. The Gradus LED Interlok Advance Lighting System offers a pin point lighting effect, meaning that you can see each LED on the strip. The LEDs are surface mounted onto strips that can be cut to desired lengths without causing any reduction in brightness. The LEDs have a lifetime of up to 50,000 hours. 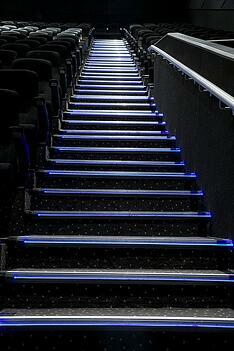 On the Gradus LED lighting strips, the LEDs are spaced at intervals of just under 4 inches (100mm). You can get the LEDs in Blue, Green, Red, White, and Amber. Continuity is an LED lighting system that provides a continuous lighting effect down the length of the step, giving a streamlined and modern finish. With this system, instead of seeing the individual LED “bulbs” on a strip, the LED units are at the end of the strip and the light is projected through a fiber optic rod. Again, the lifetime of the LED units are up to 50,000 hours, and you have a choice of color - Blue, Red, Green, and White. How Much do Stair Nosings Cost?